This project has ended, but you can still support amazing Berkeley initiatives by visiting give.berkeley.edu. Your continued support of our students, faculty and staff will ensure that Berkeley remains the #1 public university. Go Bears! The Hearst Museum is gearing up for the 2016 reopening of our remodeled Kroeber Hall gallery. One of our goals is to highlight rarely- seen objects in our gallery space, such as The Doctor. This 2,500 year-old, three-ton coffin lid is from the burial of Psamtik, a chief physician in ancient Egypt. The lid is decorated with spells asking fifteen gods for protection, ensuring his name was remembered for his eternal afterlife. Given its size and weight, it is not currently accessible except for research requests and special visits. The Doctor is part of the Hearst Museum’s impressive Egyptian collection, one of the largest and most important collections outside of Egypt. 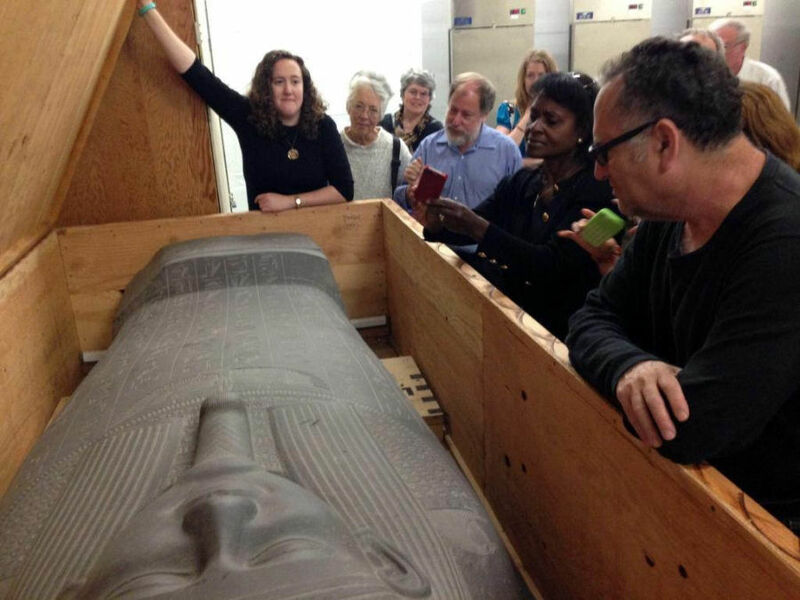 We believe that the research, teaching and public programming potential of what is the heaviest and one of the most impressive pieces in our collection of 3.8 million objects is significant. Museum History - Early collecting, and importance of the Hearst family in founding the museum. The Practice of Anthropology - Collecting objects, observing cultural practices and recording context to learn about diverse cultures, places and times. A Research & Teaching Institution - The research value branches out into interdisciplinary studies, including Archaeology, History, Language, Religion, Art History, Digital Humanities and Museum Studies. Collections Management - How we care for our collections and the behind-the-scenes activities of a museum, from documenting and conserving, to moving, storing and tracking. Visitor Engagement and Community Outreach - To be located at the Hearst Museum’s new entrance, The Doctor will be a gathering point for visitors, and play a key role in K-12, campus- and community-facing programming. We’ve checked with the structural engineers and the floor can hold the weight, and we’ve made a plan to move The Doctor from offsite storage to Kroeber Hall. Now we need to raise $20,000 to put the plan into action, including fabricating a new display mount, producing signage and an interactive digital display for a 3D model of the lid. Thank you, and we hope you would be willing to consider making a gift to support our project to bring The Doctor to the public. A digital bumper sticker to show you support the Hearst Museum. 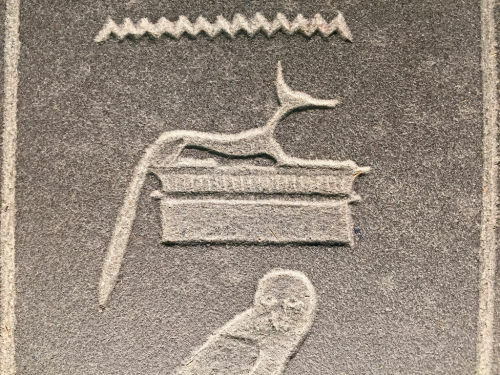 "I Heart the Hearst," in hieroglyphs! Will be sent to donors at the higher levels as well. A shout-out on the Hearst Museum's Facebook page. A digital poster of The Doctor sent by email, and all the perks from the lower levels. Along with the perks from the lower levels, you will receive an invitation to the Hearst Museum Gallery Reopening Preview Day, date to be announced in 2016. Your name will be included on the Gallery Donor Wall display in the lobby of the Hearst Museum Gallery. Includes Social Media Thank You and Digital Poster as well. You will receive a guest pass to a speaker event of your choice (member's event or special ticketed event). Also includes name on the Gallery Donor Wall, Digital Poster, and Social Media Thank You. 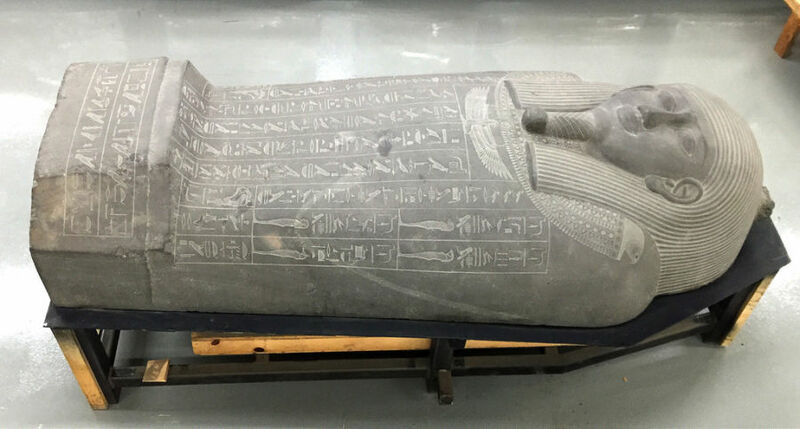 You will receive a digital copy of the 3D model of the ancient Egyptian coffin lid (in PDF form) to view, spin and 3D print! Also includes name on Gallery Donor Wall, Digital Poster, and Social Media Thank You. You will receive an invitation to a group tour of the Hearst Museum Collections storage areas. This perk is capped at 50 people due to limited space and object preservation issues. Also includes your name on the Gallery Donor Wall, Digital Poster, and Social Media Thank You! You and a guest will have a personal behind-the-scenes tour of the Hearst Museum collections, led by the Museum Director. Also includes a Digital Copy of 3D Model of the Doctor, Name on the Hearst Museum Gallery Donor Wall, Digital Poster, and Social Media Thank You!